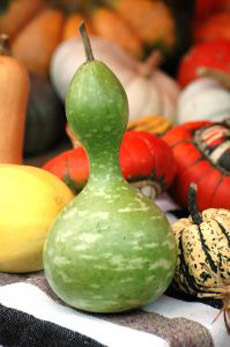 Looking like a food of the Jetsons on the one hand, the calabash squash is part of quite a few primitive cultures. Photo by Nathalie Dulex. MELISSA HOM is an editorial intern at THE NIBBLE. This is Page 2 of an eight-page glossary featuring different types of squash. Before we showcase almost 40 different types of squash, this page discusses cooking with squash. Click on the black links below to visit the other pages. See our more than 50 other food glossaries, each featuring a different favorite food. 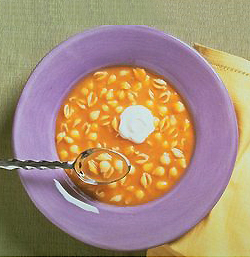 In Soups, Pilafs And Casseroles. We may have gotten pasta from the Italians (who got it from the Arabs, who got it from Chinese); but in turn, American squash in a risotto is now a classic. Incorporate squash into more of your rice and pasta dishes. And whether it’s summer or winter squash, there’s a soup and casserole for any season. Try summer squash in your gazpacho. And read the history of pasta. Cool As A Cucumber (Raw!). Summer squash types can be eaten raw and are very refreshing due to their high water content. Chop or shred them for salads or snacks to serve alongside carrot sticks and other crudités, and add them into cole slaw and macaroni salad. Cucumbers make a wonderful, uncooked “blender soup” when puréed with a bit of yogurt, garlic and fresh dill. Shave thin slices of cucumber to wrap sushi rolls. In Breads And Desserts. Pumpkin and zucchini aren’t the only types of squash-based quick breads and pies. Take the pulp of any winter squash and purée it for a pie filling; grate any summer squash into a cake or bread batter. Similarly, the squash of your choice can be the star of a soufflé, pancake, waffle, oatmeal, pudding, cheesecake or custard Everyone has had a chocolate chip cookie, but surprise guests next time with a Cinderella Squash* Chocolate Chip Cookie. *Or any squash of your liking. Toast The Seeds. Toasted seeds make great cocktail snacks, appetizers and garnishes. 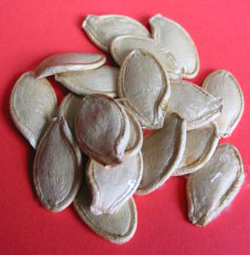 The seeds in winter squash can be scooped out, cleaned and spread across a baking pan or sheet of aluminum foil. Bake at 325°F for about 30 minutes, depending on the size of the seeds. Toss the roasted seeds in butter or oil, plus the salts or seasoning you prefer—anything from garlic and chipotle to sugar and pumpkin spice mixes. The roasting seeds are very fragrant, but keep an eye on them and don’t let the shells get too brown; chances are the seed inside will be burned. Toast me, don’t toss me! Photo by Jason Antony | SXC. Now it’s time to meet the squash. As you’ll see, quite a few of the squash are so beautiful, they can be used as table decor in a basket or bowl and enjoyed for a few weeks prior to becoming dinner. That’s how we enjoyed them in the course of writing this article! You can send beautiful squash as a gift from Melissas.com—something we began to do after enjoying our own squash sampler so much. What better way to thank someone for a terrific dinner or weekend?